Low Gap Bourbon is double distilled from a mash bill of 65% corn, 20% malted barley, and 15% malted rye. This artisanal, earthy, grain-forward Bourbon is aged for 2+ years in new charred oak Bourbon barrels, before being bottled at 43.25% ABV. 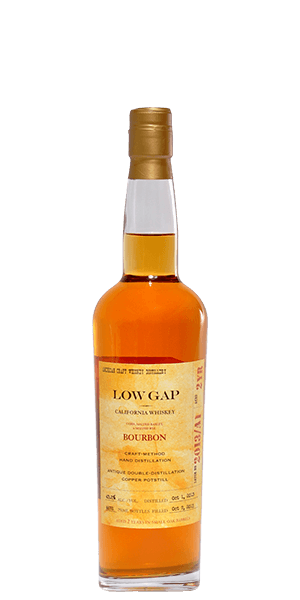 What does Low Gap Bourbon taste like? The Flavour Spiral™ shows the most common flavours that you'll taste in Low Gap Bourbon and gives you a chance to have a taste of it before actually tasting it. Sweeter than most, and not as much maturity. Nevertheless, a good a smooth pour. Fantastic Flavor! Finishes more closely to a fine Scotch than a Bourbon. Overall a great bottle. Delicious. Smooth and sweet finishes super easy. This is my favorite bourbon! So glad to see it here! So rich and delicious. Best bourbon on the market in my opinion!